Happy Birthday, Blog! And to pat myself on the back a little, congrats to me for writing for a whole year! This past year has been one with probably the most amount of change I have ever had in one year. 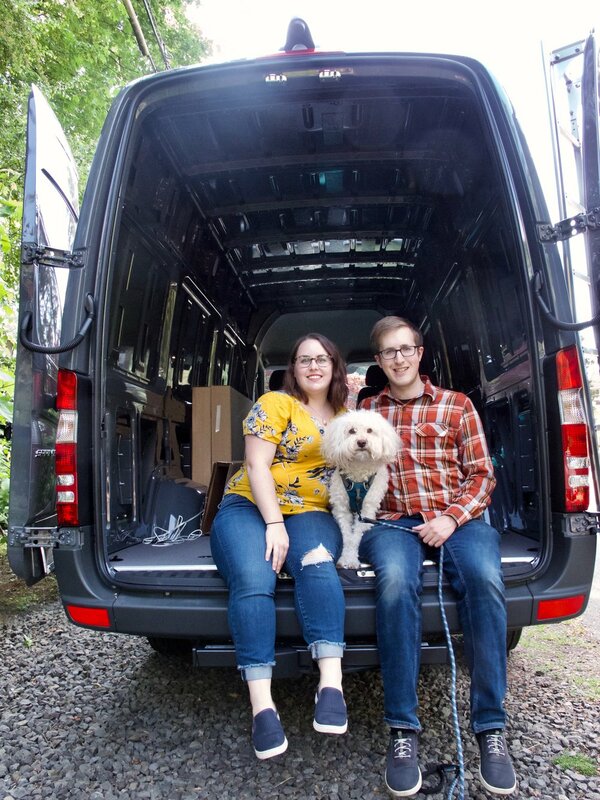 I went from living in an apartment in Portland, running an Etsy shop, and writing this blog about crafts, food, travel, etc to now living in our self converted van (currently in Austin, TX), working as a wellness coach online, and writing about the van, life on the road, and a chronicle of our adventures. But even with all of that change, many things have also stayed consistent, one of them being writing this blog. Cooking in the van has been a rollercoaster ride for us. In the fall, we were cooking on electric but were not connected up to the van’s alternator. That means that we were using a lot of energy to cook, but we weren’t getting enough into the van for all that cooking. So there were many days where we had cold meals, ate out, or just snacked all day instead of cooking. Since then, we have hooked the house batteries to the van’s alternator so we are charging significantly more and have had less of a problem with having enough power to cook. We have also switched to cooking on a propane cooktop for most of our meals (we still use the Instant Pot and blender though, so we aren’t completely off electric cooking). It seems that everyone we talk to about van life is curious about where we sleep at night. Either strangers want to know out of general curiosity, other van lifers want to trade tips, or family and friends are concerned about us. In our 4 months of van life, only once have we been asked to move for the night. And that was just a security guard at 8 pm who directed us to numerous other options, so no big deal. But along the way in the last 4 months, we have picked up a few tips, tricks, and general knowledge on the subject of overnight parking. I thought I’d share some of them here in case you were curious, concerned, or wanted some tips for yourself/a friend. A few weeks ago I wrote about the stresses that naturally come with van life and living on the road. Things like unknown noises, if we are in danger of getting in an accident, the safety of our belongings and the pup were all on that list. But what I didn’t speak about were the benefits and amazing, wonderful surprises we’ve encountered along the way in our short while living in the van. These are some, but not all, of the amazing things we’ve been able to experience because we chose to let go of our apartment life and live on the road in a van. Back in the fall, we were in a car accident and while we were perfectly fine, it left the van with a large dent in the back bumper which was letting cold air into the van. As we mentioned in our “What happened in Nashville” article, we returned to Oregon earlier than planned last November in order to get the van repaired. In the repair process, we learned quite a bit about what happens when one needs to get their van fixed and deal with insurance. Living in a van is fun. It’s wonderful and amazing and you get to see beautiful things. But, it’s also very stressful. There are so many things to constantly fuss over and worry about that you end up having a lot of routines and checklists before you do anything or go anywhere. We have a process for making and unmaking the bed. We have a checklist for being able to drive anywhere. We have a standard to-research list before getting to a new area. We have a routine and mental notes about when we last dumped grey water and the toilet. And so many more routines, checklists, and to-dos. One of our goals in 2019 is to meet more people and make more friends who also live in vans, travel full time, or we relate to in general. We tend to be very introverted and have difficulty putting ourselves into uncomfortable situations, new situations, or situations where we might feel judged. But this is the year of overcoming that fear and just jumping in.